I’d visited Long Creek Falls on the Appalachian Trail back in the spring. It was a terrible day for photography. The sun was bright and well into the afternoon sky. There were shadows cast everywhere from the dense forest canopy that was above me. I took the time to enjoy the time spent in the outdoors, but there was no hope for decent captures of the falls. I went back last week knowing the early morning hours would be best. Even though I hit the trail later than I had planned to, there was a thick blanket of grey clouds overhead that allowed me to shoot at my leisure. It was a wonderful day to be outdoors with my camera. I captured this image using my 24-70mm f/2.8, tripod mounted and using a circular polarizer. You can see an image from my previous visit here. Thanks as always for stopping by. 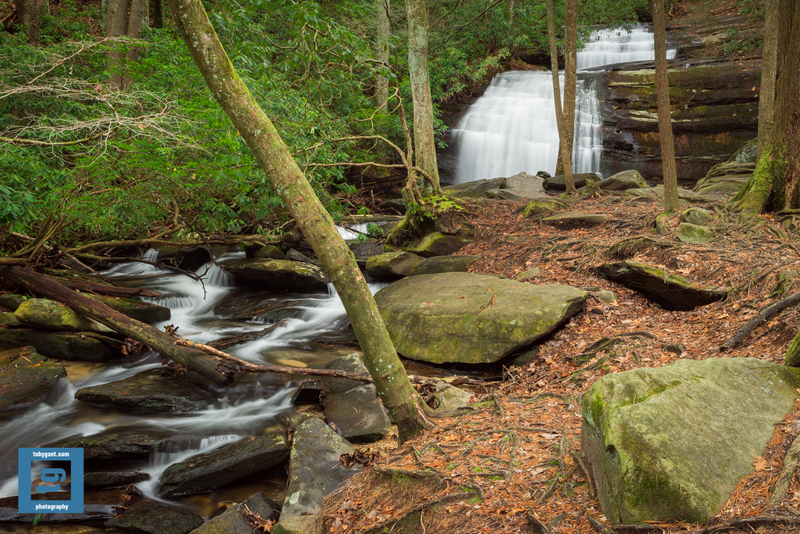 This entry was posted in Adventure, Appalachian Trail, Fine Art, Fine Art Photography, Nature, Photography and tagged Appalachian Trail, explore, fine art, Georgia, landscape, outdoors, photography, Toby Gant, waterfall by tobygant. Bookmark the permalink. Beautiful photos of the falls, as always, Toby! That looks like some very beautiful, peaceful woods for hiking. It’s a beautiful place, Lavinia. It is however very near the southern starting point for the Appalachian Trail and therefore gets quite a bit of traffic. Most days it’s buzzing with hikers. Stunning photo. I compared it with the earlier one which you took when the sun was very bright. That has a certain charm too. What does a circular polariser do? Thanks for the kind words. The CPL does a couple of things. First you lose at stop and a half of light which makes it easier to give the water the “flowing” effect. And you can also remove reflections from the water and wet rocks. It really saturates the color. I like the look of the water. It’s “white” but not blown out. Thanks for the kind words, Eric. Thanks as always for the kind words, Seonaid. I definately prefer the soft light for capturing falls. It really depends on the subject. I prefer to shoot landscapes in mid-day sun. All that said, I love your style. Your images are amazing. Thanks for the kind words, Josh. Absolutely beautiful! Thank you for sharing and bringing back the memories! Love waterfalls, miss being able to photograph them. Hopefully will be able to find them when we travel to eastern Russia. I got to shoot a couple in Abkhazia this summer, if your interested I have posted them on my blog.